Rosh Hashanah, the Jewish New Year, is traditionally celebrated with lots of honey. But Israelis have to dig deeper and deeper into their pockets for it: according to a recent study, it costs 350% more than in America and twice what it costs in Britain. This is especially burdensome at Rosh Hashanah, when 40% of all Israeli honey consumption occurs. Recent months have seen generalised Israeli outrage over the high cost of living. The relatively good economic performance of Israel has not prevented discontent from spreading within the population. The first fact that should be noted is that, despite having grown at a fast pace in the last decade, Israel remains a country with a per capita income level lower than that of Spain ( $27,800 against $31,550). In fact, it is very similar to that of Greece. Currently, the main macro indicators of the Israeli economy are healthy. Public deficits are low, the unemployment rate is below 6% and inflation-at least as measured by the consumer price index - is higher than the average for OECD countries but does not seem worrying. The forecast growth rates for 2011 and 2012 are over 4%, although these do depend on two important assumptions over which there is risk: the stability of the geopolitical situation in the area and the continued recovery in the global economy. However, the good overall position hide important problems that make many Israeli citizens feel poor and which weigh down on potential growth. To learn more about the current problems of the Israeli economy and its causes, I talked to Corinne Parenti-Sauer, co-founder of the Jerusalem Institute for Market Studies (JIMS), a prominent pro-market think-tank. She argues that the protesters are right to be outraged, given the very high cost of living and skyrocketing housing prices. However, she warns that their policy demands are often point badly conceived. She offers the example of the market for milk, a staple whose price is much higher in Israel than in other countries. Why does this happen? Corinne says the milk production sector operates under "Soviet conditions": a committee and its bureaucrats are the ones who decide how much milk is produced, who produces it and at what price it will sell. In addition, imports and competition are prohibited under the "Milk Market Planning Act". In other food products like honey , wine, or cheese competition is also virtually absent, largely due to government interference in these markets, for example, by discouraging imports. It ends up that only one or two companies usually control these markets, leading to high prices. Housing costs, which sparked off the J14 protests, are another crucial component of the public good. On the one hand, there are fears that there is a property bubble which may be about to burst . 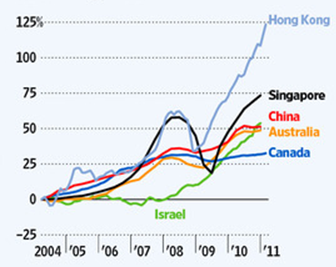 The Central Bank of Israel has warned that the rapid rise in housing prices could threaten economic stability. On the other hand, the Jerusalem Institute for Market Studies points to the strict regulation and restriction of housing supply with its origins in government intervention-as a key factor in explaining the high cost of the flats. Some figures illustrate the problem: Israel is ranked 121st and 147th (of 183 countries) in the ease of obtaining building permits and the ease of registering property respectively, according to the World Bank. The complexity and bureaucracy of these processes takes more than four times as long as the OECD average. With a less regulated and bureaucratised housing market, prices could be reduced significantly. In addition to regulation, the high taxes levied on real estate - about 75% higher than in the OECD - are another factor that explains the anger-inducing cost levels. The high cost of living suffered by Israel in relation to other countries is also reflected in gasoline prices, which double the American and Canadian level and at least 50% higher than in most EU countries. The causes, according to the JIMS, include the excessive concentration of economic power in the hands of a few "oligarchs" who control a substantial parts of the Israeli economy. This is compounded further by the large public subsidy programs provided by the Government which end up disproportionately benefiting large corporations at the expense of smaller ones. The other major problem that is mentioned frequently by the protesters is the high incidence of poverty. This is particularly prevalent in certain groups such as the ultra-Orthodox Jews and Israeli Arabs, and also for Ethiopian Jews, who have more generalised assimilation troubles. Data from the Ministry of Social Security show that the poverty rate has been increasing over the last decade. However, JIMS is not convinced of the reality behind the numbers. The measure of poverty is relative and increases with increasing average income, so the poor in 2000 would remain so even if their income had increased at the same rate as average income. The measure seems unhelpful. Official statistics provide a particularly negative view. However, according to the JIMS, the number of poor fell by 18.8% from 2004 to 2008 (from 18.1% to 14.7% of the population) and the real disposable income of the 20% of workers with lowest wages increased more than 8% between 2002 and 2008. These data demonstrate that economic growth in recent years has also benefited those on lower wages, whatever is said by some Israeli politicians. All in all, JIMS concludes that Israel could achieve significant economic growth were it to continue the process of liberalization and deregulation initiated a decade ago. The excessive micro-interference of the state, the corporatist model of economic organisation, with powerful unions and powerful business interests dividing up economic spoils, feeds directly into the complaints of outraged youth protesters.